Origin: Dactylo- finger; -rhiza roots. not surprisingly from the shape of the root system. A genus of up to 60 superficially similar species that have a predominantly central and northern European distribution although a number of species do reach the Mediterranean and north Africa. More recently, Coeloglossum viride (Frog Orchid) has been included in this genus. 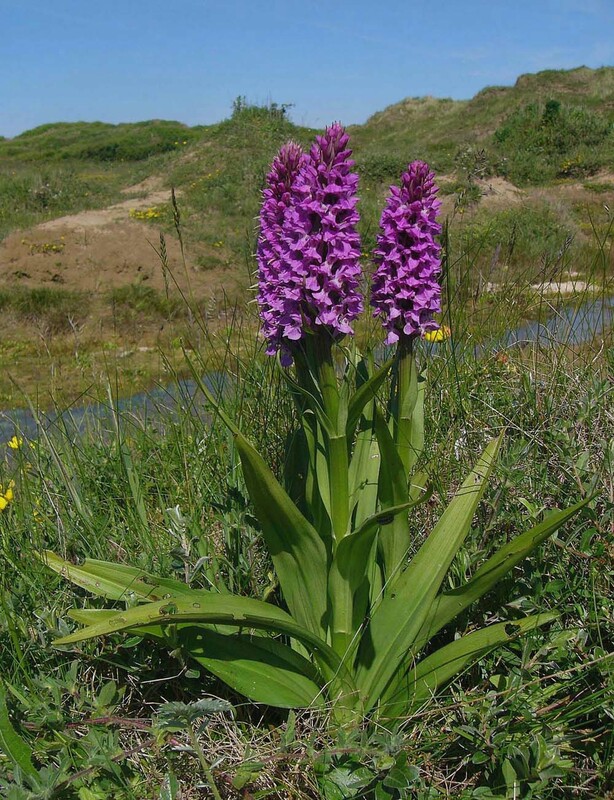 The Dactylorhiza genus is tricky and presents many problems of identification for even the experienced field botanist. At the morphological level the flowers of most species are relatively similar (D.viridis being the exception), within any species the flowers can show considerable variation in a single population and finally many species hybridize quite readily. Some help comes at the chromosomal level (see here for more detailed explanation) where the genus can be divided into two groups, the diploid group (with 40 chromosomes) and the tetraploid group (80 chromosomes).